"For over 50 years we've had the peace sign that we all know. Unfortunately, the symbol with the "arms" facing down, represents death and despair. We've taken the symbol and simply turned it around. Now the arms are raised up in hope, joy and positive energy. Rather than anti-war, it's pro-peace. It may seem like a small change, but as you know, it's always better to wish for what you want, rather than what you don't want. Only a positive intent achieves a positive result." 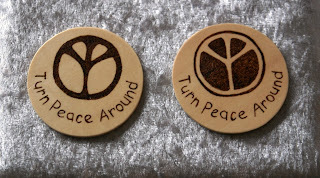 This is the introduction on the "Turn Peace Around" Etsy shop's front page, an it says it better than I ever could! I love the idea behind this shop, and I love the pieces they have for sale there too! They currently carry hemp jewelry, beautiful hand-painted totes and magnets and have plans to offer much more in the future as well. I personally have my eye on one of their totes, and if you agree with their message and like to shop green, I can't think of a better bag for the cause so you should check them out too! TO VISIT TURNPEACEAROUND'S SHOP YOU CAN CLICK THE PICTURE ABOVE OR, IF YOU'D RATHER, CLICK RIGHT HERE! Wonderful, insightful and inspiring walk through Turnpeacearound that's a great way to start 2010. That's so cute! Great way to start the new year! Hope you'll create a movement out of this!